Good afternoon sweeties! So today I have something super fun to share with you! This is the Crelly Crate RE-visioned...bespoke trios based around a general theme and complementary palettes. 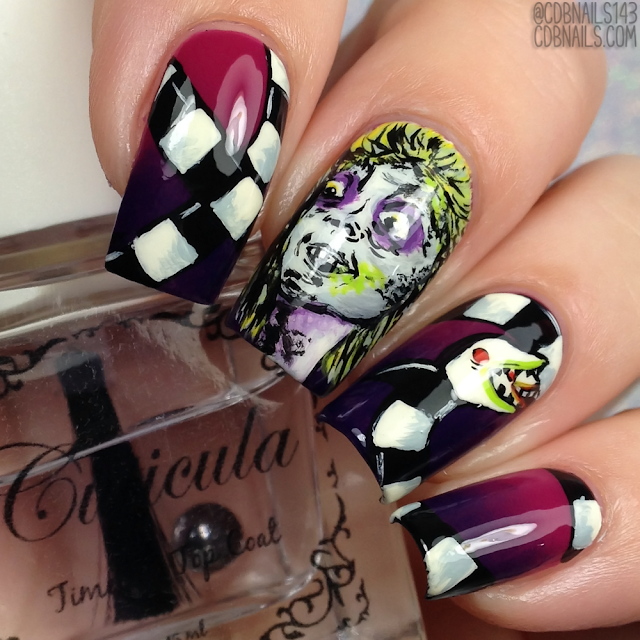 The fall vision is inspired by films from the legendary Tim Burton - Beetlejuice, Corpse Bride and Nightmare before Christmas. There are three makers per film to bring the wonder and excitement of the screen into the bottle! Furthermore, polishes can be purchased individually or by movie trio (with a slight pricing discount) – there are no set boxes – so you can mix and match and build your own autumn/Halloween collection! Read on for more info! 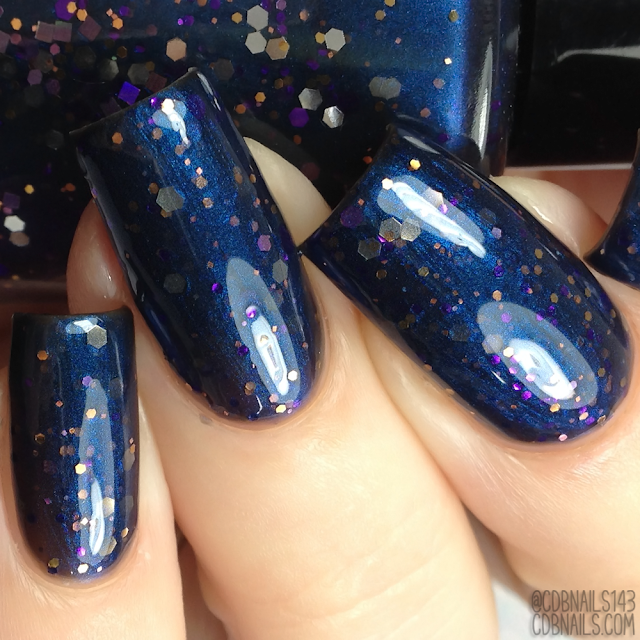 Described as a light blue crelly with aurora shimmer, red metallic microflakes and red/gold flakes. Shown here in 2 coats plus top coat. Dries semi glossy with subtle texture. Top coat needed for a full glossy finish. Described as a black crelly with a strong midnight blue shimmer and assorted copper, purple, violet and silver glitters. Shown here in 2 coats plus top coat. Dries semi glossy with texture. Described as a very pale chartreuse crelly with a strong green shimmer and gold iridescent flakes. Shown here in 2 coats plus top coat. Dries semi glossy with some texture. Described as a medium grey crelly base with a soft blue shimmer, teal green to blue ultra chameleon flakes, and a sprinkle of silver and lime holographic micro-glitter. 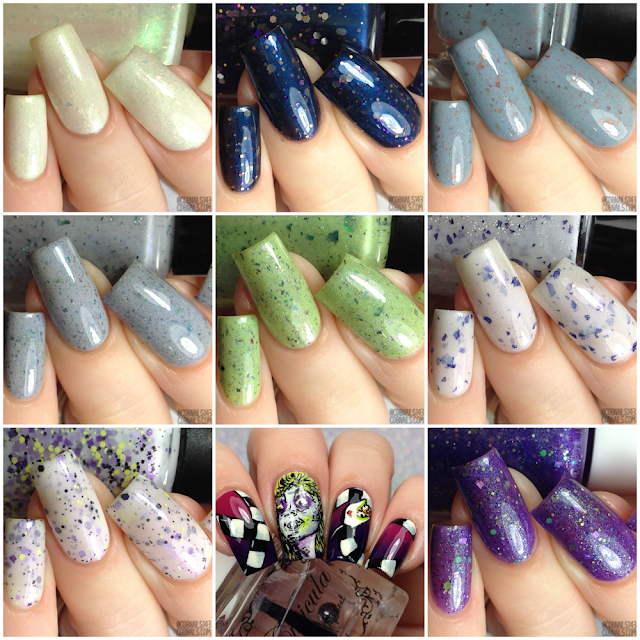 Described as a medium lime green crelly with a subtle violet to blue to green shimmer scattered holographic, purple metallic micro flakes and 6 different types of UCC flakies. 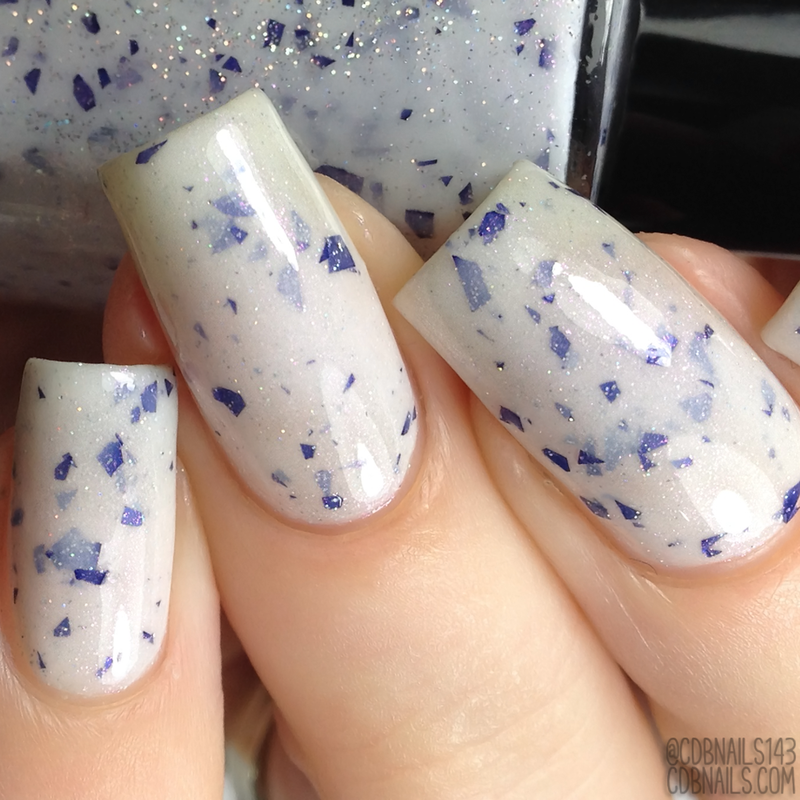 Described as a marshmallow white crelly with purple glass fleck, tons of holo sparkle and royal purple flakies. 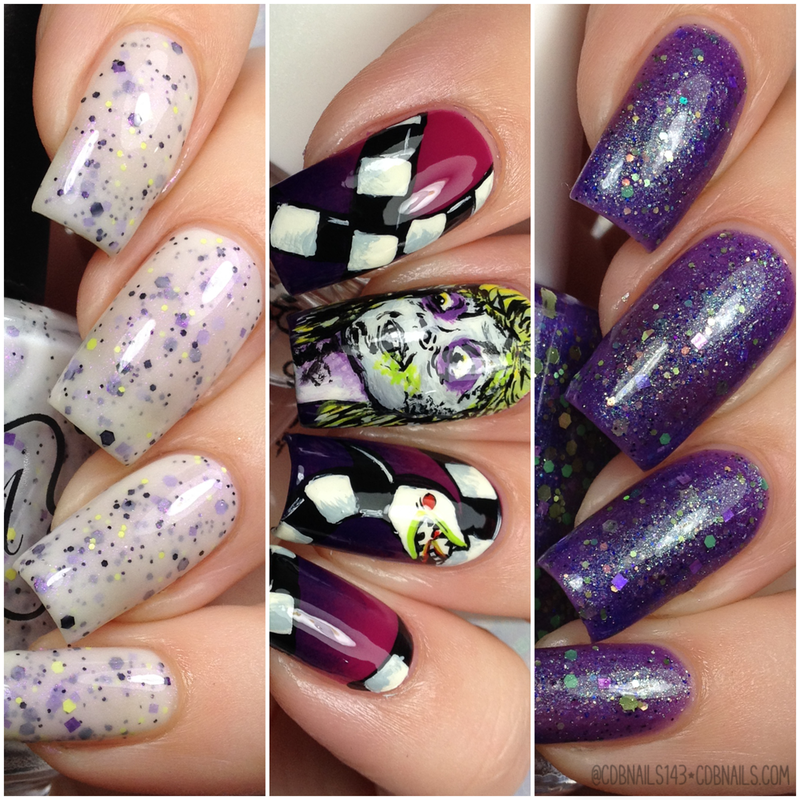 Described as a purple crelly with strong green shimmer, and purple/lavender/green/lime glitter in various finishes and sizes. Polish'M-I'm The Ghost With The Most, Babe. Described as a true white crelly with black, grape purple, lavender and apple green matte glitter and a purple fleck shimmer. 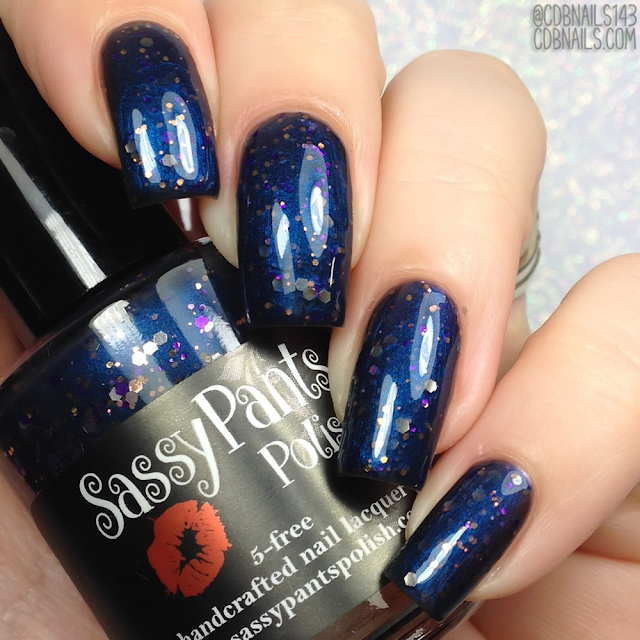 Described as a scented top coat called “Let’s Turn Up the Juice"
Shown here in 1 coat. 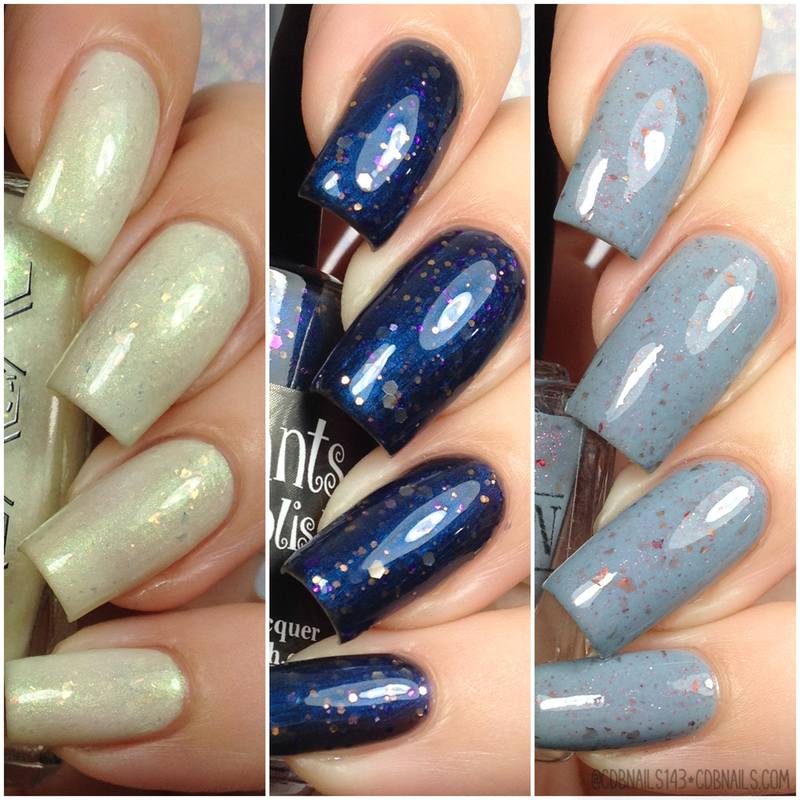 Polishes will be available individually or can be purchased in trios for a discounted price. 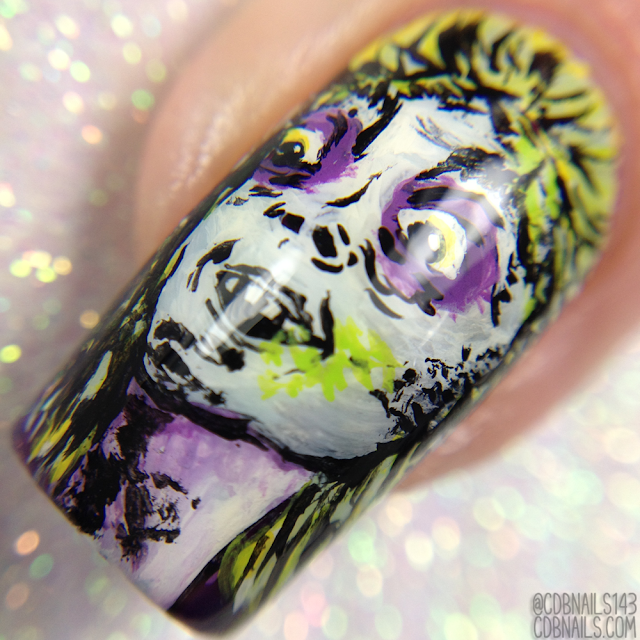 Your Beetlejuice portrait is 100% amazing! I wish that Bees Knees was glow-in-the-dark, it's got that classic GITD pale color going on! I love your swatches! Great angles, lighting and straight to the polish!! ^^ Thanks for introducing me to this, I love them!